Take in the Chinese and French architecture of the Nanxun Water Village on this private tour from Shanghai. Listen to your guide's commentary on the culture, history, and architecture of this unique village in the Yangtze Delta region as you explore the peaceful waterways, on foot, via gondola ride and rickshaw ride. This private tour ensures the ability to travel at your own pace and personalized attention from your guide. 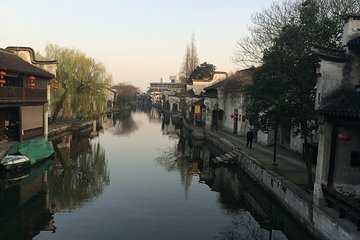 Tour was good, but I expected Nanxun to be Chinese Venice and it is not. Too little time on the boat, mostly walking tours and ride from and to Shanghai is more than an hour one direction. Or even longer.